A day at the beach. Oh how the salt air does wonders for both of us. But, but, I have to say, poor Texas, you try to have beach front, but you just can’t compete with San Diego. Oh man. First, we made the mistake of thinking how fun it would be to take a walk out of the pier. Our pier in Oceanside is great. It has it all-great people watching, people fishing, walkers, joggers, families, drunks, a restaurant at the food guaranteed to coat your arteries, and of course the bait shop with creepy Carl. But what does the pier in Galveston have? People fishing. That’s it! So we rolled up (literally, in our double jogger) and barely had room right down the middle to squeak by all the people fishing. And clearly the casual wanderer isn’t very common cause, man, did we get some looks! 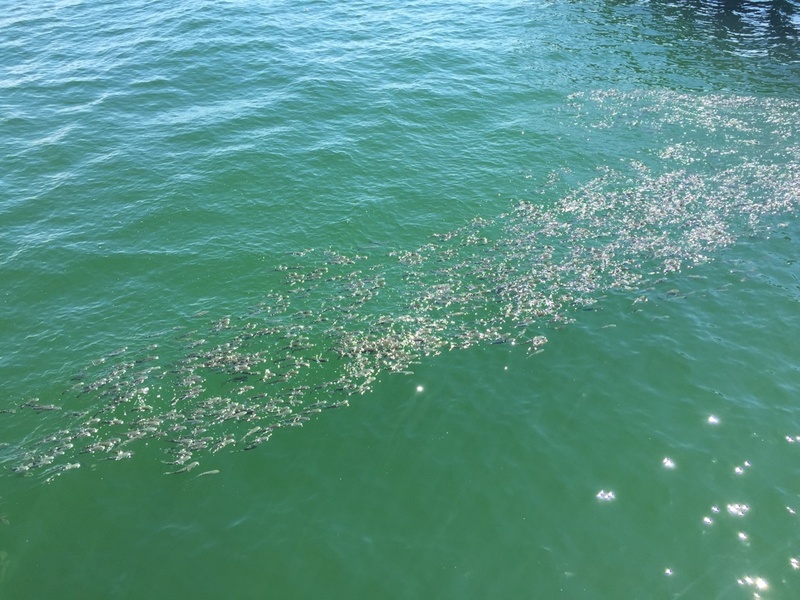 I will say though, I don’t know what was going on but there were schools of fish swimming on the surface of the water right by the pier… so that was kinda cool. 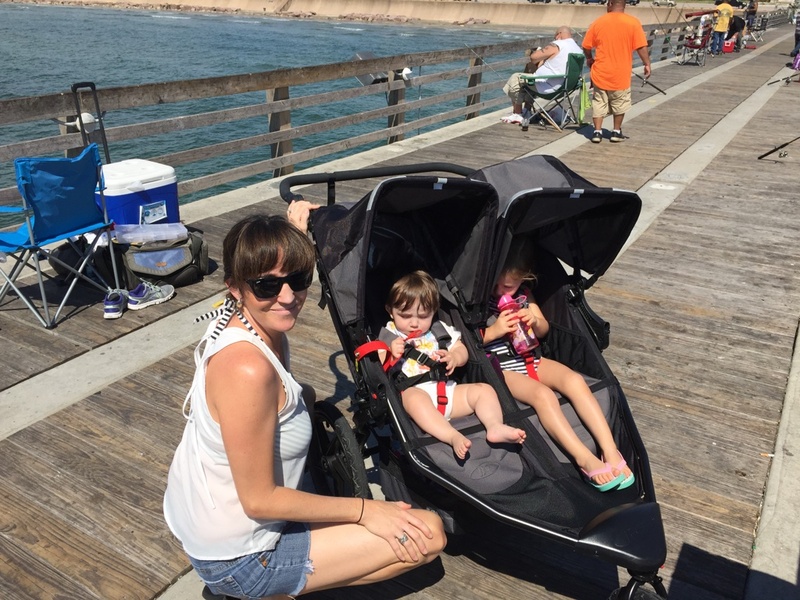 But after taking 15 minutes to get the kids lathered up with spf, loaded up into the jogger and onto the pier, we left. We drove a few miles down the beach to find some sand. That, and we needed shade and spotted some umbrellas and I thought, hmmm, you can rent umbrellas (one point for TX!) since we haven’t bought one yet. So we unload the kids for the second time, and made our way to the chairs and umbrellas. It costs $25 to rent one! What a joke. So I decided that’s what spf is for, and grabbed our rain umbrella (which we of course now have in the car at all times like any good resident here does). We found a spot and enjoyed the day in the sunshine and water. 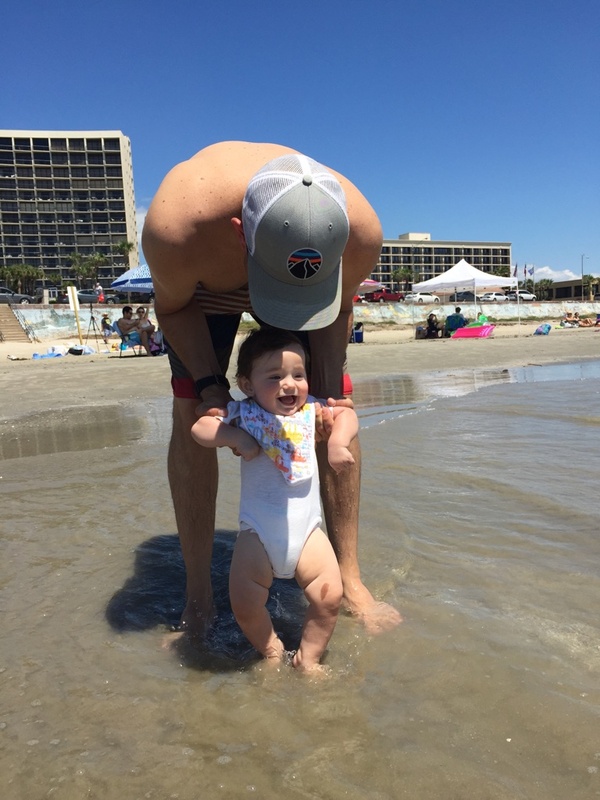 It was only 90-a cold front has been sweeping across Texas, we’ve even gotten down to the low 80’s!- so it was pretty nice at the beach. Sadly though, we are spoiled. We both tried to make the most of our time at the beach but Brandon was bemoaning the lack of waves and while I did enjoy the surprisingly warm water, I found myself longing for some softer sand, cooler weather, and no dogs on the beach (ewwww.) I know, we love dogs! But I seriously can’t stand dogs on the beach. I don’t know if it’s the nasty wet,sandy dog thing, or because I’m barefoot and people don’t always clean up after their dogs, or the fact that my last encounter with a dog on the beach was when Brandon and I took the kids to Oceanside down at sunset with pizza and a dog not on it’s leash ran up to my piece and licked it. The owner stopped it before he could eat it, and I was like ummm you can go ahead and have it! Anyway, it was good to be outside, nice to smell the salty air, and the kids of course loved it. So even though it’s a significant drive (1.5 hrs) I think we’ll be going back simply because,well, it’s the ocean. Like a moth to the flame..
Ah – Texas!! I’m sure the kids don’t know the difference – the beach is still the beach – you can get wet, sandy and sunburned! So glad you have a family day to enjoy together! Love the pix – we can “see” the whole scene – makes me smile and feel like you are not so far away after all… Happy Sunday! Way to make the most of it!